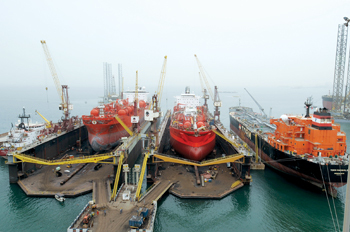 ASRY, the leading ship and rig repair yard in the Arabian Gulf, has hailed a deal it signed with the Organisation of Islamic Ship Owners’ Association (OISA) saying it would boost business particularly in rig repairs and shipbuilding. The deal was described as a “memorandum of permanent cooperation” and Asry chief executive Nils Kristian Berge said it would enhance cooperation between the yard and OISA’s member countries and, subsequently, navigation and shipping companies. He added it would help Asry hold wider meetings with the owners of such companies and decision-makers reflecting positively on its future activities while also serving as a legal reference for potential bilateral agreements with OISA member states. Signing the MoU were Asry’s ship repair general manager Magdy Sharkawy and OISA executive committee chairman Mohammed Shawky Younis. Sharkawy added that the agreement aims at developing a strategic plan for business cooperation with OISA member countries especially in rig repair and shipbuilding and at sharing both tangible and intangible resources to effect a seamless exchange of information between both parties resulting in efficient and solid business relations. Under the terms of the MoU, Asry will provide expertise and services for the docking and maintenance of OISA members’ vessels, he said. “It will also support such vessels with priority high quality service in a timely cost-effective manner and share the results of case studies and researches related to previous dockings with OISA members. This can be beneficial to them in raising technical standards and efficiency, which is of utmost importance in operating a cost-effective fleet,” he added. Meanwhile, Asry promoted Rob Bryant to be the new general manager of the offshore services division, effective immediately. Bryant brings more than 40 years of shipyard management experience with global leaders such as A&P Group, CTC Marine and KVASIR. He will lead the offshore services division which focuses on rig repair work across the Middle East and globally. Bryant, a Briton, was promoted from commercial manager at Asry, and prior to that spent three years as a sales and marketing consultant with KVASIR Group, a UK-based offshore and marine project management firm.